No, Birth Control Isn't Dangerous--But Guess Who Wants You to Think It Is? what’s real and how best to take care of their health. Is the link real? Probably. Doctors have long noted a detectable association between breast cancer and reproductive hormones including estrogen and progestins. Should you stop taking your pills or swap out your hormonal IUD for a hormone-free copper one? Probably not—not if you want to be as healthy as possible and save parenthood for when you feel ready. 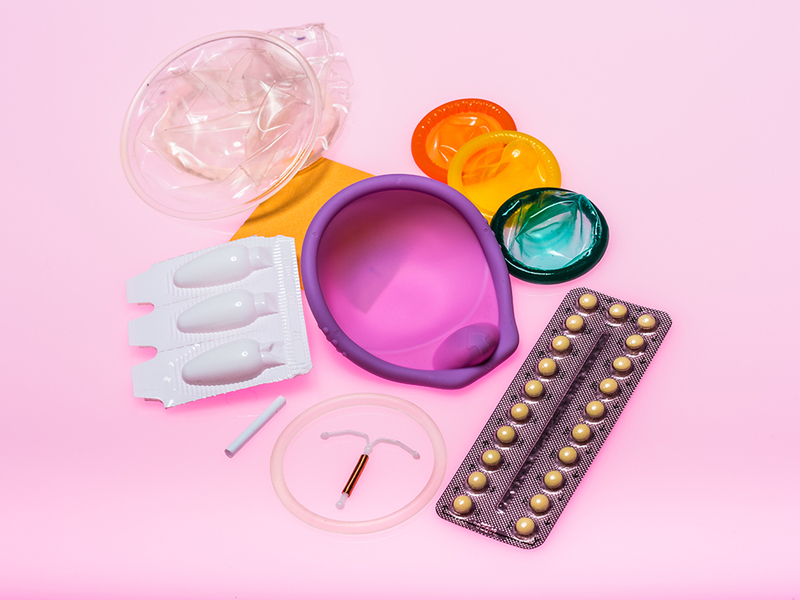 Which birth control is best for you depends on a bunch of factors because each contraceptive has its own profile of pros and cons, likelihood of actually working as birth control, potential side effects, and—for some methods—bonus health benefits. At the top of the reliability pyramid are the “get it and forget it methods” – IUDs and implants that have an annual pregnancy rate of less than 1 in 500. In between abstinence and implants lie hormonal methods like the Pill, patch and ring; and below them on the reliability scale lie barriers like condoms and diaphragms. 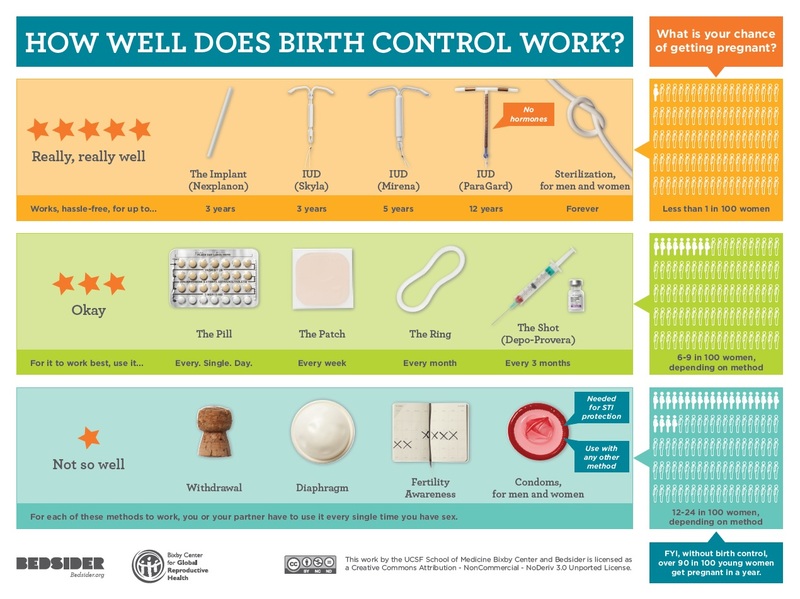 Most couples find it hard to use an everyday or every-time contraceptive method perfectly, so couples relying on the pill or barrier methods end up facing a surprise pregnancy with surprising frequency: 1 in 11 each year on the pill; 1 in 6 with condoms. If you’d strongly prefer not having to choose between an unexpected abortion and an unexpected kid, which method you choose is a big deal. Only condoms and female condoms protect against sexually transmitted infections. Because of how they work—by getting your body to seal off the opening to the uterus—hormonal IUDs may offer some protection against pelvic infections. Intermittent abstinence methods like the rhythm method reduce opportunities for transmitting infections. And a ring that protects against HIV and other viruses is in clinical trials. But condoms are the only thing that provides substantial protection against most STIs. So, even if you choose something that works, say, 100 times better for pregnancy prevention, it’s still smart to “double Dutch” with condoms whenever STIs might be a risk. Net-net, hormonal birth control methods give some protection against cancers. The same methods that appear to slightly increase breast cancer risk also appear to slightly decrease the risk of ovarian and endometrial cancers and possibly cancer of the gastro-intestinal tract. In other words, if your method of choice is the pill, patch, ring, or hormonal IUDs, your total cancer risk is likely lower than it would have been with a non-hormonal birth control method or none at all. A list of other bonus health benefits including cancer protection by method can be found here. No one method is right for all women. Women with a history of breast cancer should actually not use hormonal birth control methods; in fact post-chemo medications like Tamoxifen work by suppressing related hormones below their natural level. Other health conditions like diabetes or heart disease can also rule out some methods for some women. And lastly, no medication is 100 percent risk free; there are people among us who have intense reactions to milk or peanut butter. The same is true for synthetic hormones. Even when that is not the case, nuisance side effects can be miserable, and it’s not possible to know who will get hit with what except by trial and error. Individual differences also dictate which bonus health benefits a woman might select. My daughters love their hormonal IUDs because they like having lighter, less frequent periods, but because of migraines I use a copper IUD. A friend with severe monthly cramps and bleeding found that the implant worked best to reduce her symptoms even though hormonal IUDs are most often prescribed for this purpose. Women who want the bonus benefit of reducing acne often choose pills containing estrogen; women with endometriosis often choose a method that suppresses menstrual cycling. You don’t have to remember all of this. Good teamwork between your healthcare provider and you means that he or she brings to the table medical expertise, including expertise about how different birth control methods work. You bring expertise on your priorities and what has and hasn’t worked for you in the past. Never forget: It’s your body and your life and your provider is your paid consultant. Not contracepting or using less effective methods carries a different set of health and mental health risks. Having a baby-capable reproductive system is complicated, and it carries a package of inherent risks. In the United States, about 800 women each year die from complications of pregnancy and childbearing (that is one pregnant woman in 5780), and tens of thousands are left with short-term or permanent health impacts. Mental health can be affected by the pregnancy process itself or the subsequent challenges of raising kids under adverse circumstances. For a woman who wants a child, these risks are well worth it; but about half of pregnancies, including those that created health problems, were unsought. Being able to delay or limit pregnancy and bring kids into the world with a parenthood partner you love when you feel ready has huge health benefits. Birth control isn’t perfect, and hopefully the options available to our daughters (and sons!) will be better than those available today. But we have options that our mothers and grandmothers could only have dreamed of. An array of reliable methods means that there’s at least one excellent choice for most women. So, why must we deal with repeated cycles of media-driven panic that leave us doubting ourselves and our birth control choices, or worse—anxiously avoiding the topic until we face a pregnancy scare? Unfortunately, drug companies have burned trust by trivializing or denying medication problems when they do occur. That can leave us all feeling vigilant and primed to suspect greed-driven cover-ups. In the case of contraception, they also burned trust by testing early, high-dose contraceptives on poor women, many of them Black, which created a deep wariness that persists to this day. But even when pharma and regulatory agencies are doing their jobs well and serving the public interest, several other groups have reason to exploit that mistrust—and in particular to hype any side effect or risk that might be associated with birth control. Top of the list, of course are anti-contraception bishops, Protestant fundamentalists, and other cultural conservatives who would rather see women in more traditional roles with less sexual autonomy. These folks have now rolled out a massive anti-family-planning campaign in Africa to scare women away from birth control, a campaign framed around anti-colonialism and purported health risks. (At the very worst are priests who have told African parishioners that condoms cause HIV.) This campaign spills over in the U.S. because it was founded, honed and funded in religious organizations here. Then there is a whole legal sector whose revenues depend on “bad birth control” class action suits. This sector, which came into being in the 1970s has more advertising options and dollars than do public health advocates who are trying to get out solid, unbiased information about family planning options. Their scary ads dominate the airwaves in some areas of the country and for some women are the primary source of information about birth control. Alternative medicine advocates go out of their way to tout the upsides of natural products and the downsides of mainstream evidence-based medicine, including contraceptives. Most of the time this advocacy is benign, even if the alternative approach doesn’t rely on controlled research. But when it comes to sexual health that isn’t necessarily the case. Our bodies are optimized to produce the maximum number of surviving offspring who live to reproduce, not to maximize our own health and longevity—or even theirs. Nature’s way, as celebrity cases like the Duggars remind us, means lots of babies—with women’s lives structured around them. But what about The New York Times? Because of how media traffic works, opinion writers and even trained journalists are under constant pressure to find the most provocative angles on any given topic. With competition for ad revenues driving competition for click count, that pressure is only growing. Social media increasingly operate as “outrage generators,” and traditional news outlets often compete by printing what’s most alarming rather than stories that land in the solid center of what’s real. The New York Times has experienced a surge in paid subscriptions from people who would prefer a different set of journalistic priorities, but that doesn’t make them--especially the headline writers--immune from these pressures. Until the consuming public at large wearies of hype, we all need to be mindful of the ways that these dynamics are pulling us off balance. The centering point of reproductive health is this: Women, children, and even men do best when people are able to decide whether, when, and with whom to bring a child into the world—when parents are able to build resources like education and financial stability and then form families with co-parents of their choosing when the time feels right. Modern contraceptives can help them do this, and when freely chosen by each person according to their needs and goals, can pay dividends in health and wellbeing. That is awe inspiring if you think about it; and someday, when we all regain our equilibrium, it may again be newsworthy. ExChristian.Net: No, Birth Control Isn't Dangerous--But Guess Who Wants You to Think It Is?